. 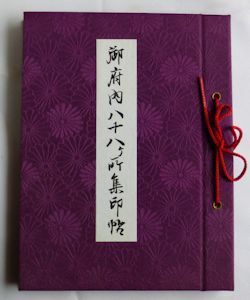 Kobo Daishi Reijo 弘法大師霊場 Kobo Daishi Henro Pilgrimages in Japan . 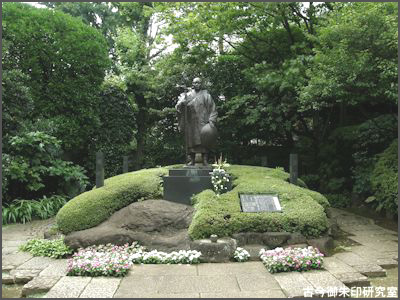 This pilgrimage was established in 1755 by Shootoo Oshoo　正等和尚 Shoto Osho (1703-1774). 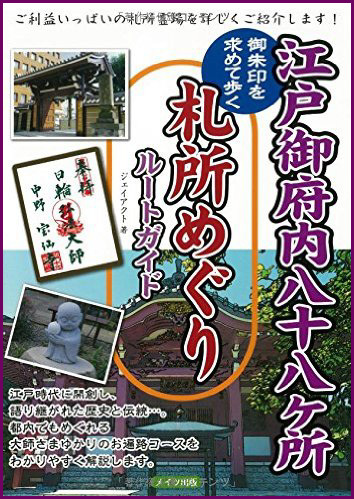 Gofunai or 府内 Funai referred to the part of Edo that was under the jurisdiction of the machibugyoo 江戸町奉行 city magistrate. 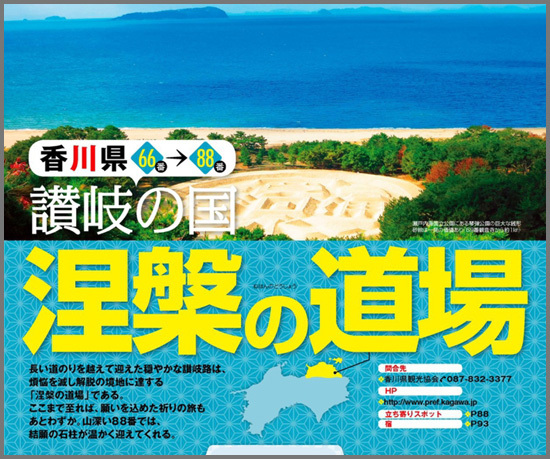 Fukagawa, Itabashi, Shinagawa, Honjo, Senju and Yotsuya were included.
. o-sunafumi, osunafumi お砂踏み stepping on sacred sand . Some temples have お砂踏の石 a stone memorial, a flat stone to step on with the "Sacred Sand" in mind, or a statue of Kobo Daishi to walk around. The Henro pilgrim is always walking together with Kobo Daishi　二人同行, usually wearing white robes, a hat and a walking stick, symbolizing Kobo Daishi. 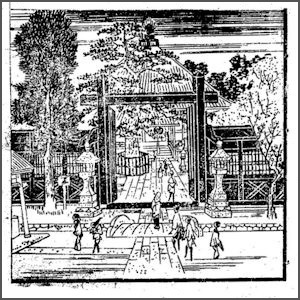 The go-eika ご詠歌 chant of the temple is the same as the corresponding to the temple with the same number in Shikoku. 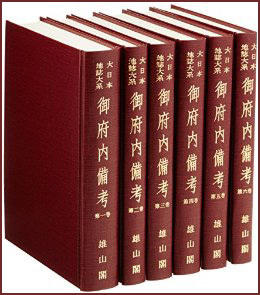 Jippensha Ikku 十返舎一九 (1765–1831) mentiones this pilgrimage as　東都大師巡八十八箇所. He wrote that many people start a pilgrimage to seek healing from an illness or pray to stay healthy until the day they have to die, so as not to become a burden to their family.
. 02 東福寺 Tofuku-Ji / 03 多聞院 Tamon-In .
. 04 高福院 Kofuku-In / 05 延命院 Enmei-In .
. 06 不動院 Fudo-In / 07 室泉寺 Shitsusen-Ji .
. 08 長遠寺 Choon-Ji / 09 龍巖寺 / 龍岩寺 Ryugan-Ji .
. 10 聖輪寺 Shorin-Ji / 11 荘厳寺 Shogon-Ji .
. 12 宝仙寺 Hosen-Ji / 13 龍生院 Ryusho-In .
. 14 福蔵院 Fukuzo-In / 15 南蔵院 Nanzo-In .
. 16 三宝寺 Sanpo-Ji / 17 長命寺 Chomei-Ji .
. 18 愛染院 Aizen-In / 19 青蓮寺 Shoren-Ji .
. 20 鏡照院 Kyosho-In / 21 東福院 Tofuku-In .
. 22 南蔵院 Nanzo-In / 23 薬研堀不動院 Yagenbori Fudo-In .
. 24 最勝寺 Saisho-Ji / 25 長楽寺 Choraku-Ji .
. 26 来福寺 Raifuku-Ji / 27 正光院 Shoko-In .
. 28 霊雲寺 Reiun-Ji / 29 南蔵院 Nanzo-In .
. 30 放生寺 Hojo-Ji / 31 多聞院 Tamon-In .
. 32 円満寺　Enman-Ji / 33 真性寺 / 眞性寺 Shinsho-Ji .
. 34 三念寺 Sannen-Ji / 35 根生院 Konsho-In .
. 36 薬王院 Yakuo-In / 37 萬徳院 Mantoku-In .
. 38 金乗院 Konjo-In / 39 真成院 Shinjo-In .
. 40 普門院 Fumon-In / 41 密蔵院 Mitsuzo-In .
. 42 観音寺 Kannon-Ji / 43 成就院 Joju-In - 百観音成就院 Hyakkannon .
. 44 顕性寺 Kensho-Ji / 45 観蔵院 Kanzo-In .
. 46 弥勒寺 Miroku-Ji / 47 城官寺 Jokan-Jii .
. 48 禅定院 Zenjo-In / 49 多宝院 / 多寶院 Taho-In .
. 50 大徳院 Daitoku-In / 51 延命院 nimei-In .
. 52 観音寺 Kannon-Ji / 53 自性院 Jisho-In .
. 54 新長谷寺 Shin Hasedera / 55 長久院 Chokyu-In .
. 56 与楽寺 Yoraku-Ji / 57 明王院 Myoo-In .
. 58 光徳院 Kotoku-In / 59 無量寺 Muryo-Ji .
. 60 吉祥院 Kissho-In / 61 正福院 Shofuku-In .
. 62 威光院 Iko-In / 63 観智院 Kanchi-In .
. 64 加納院 Kano-In / 65 大聖院 Daisho-In .
. 66 東覚寺 Togaku-Ji / 67 真福寺 Shinpuku-Ji .
. 68 永代寺 Eitai-Ji / 69 宝生院 Hosho-In .
. 70 禅定院 Zenjo-In / 71 梅照院 Baisho-In Arai Yakushi .
. 72 寿 不動院 Kotobuki Fudo-In / 73 東覚寺 / 東覺寺 Togaku-Ji - 亀戸不動 Kameido Fudo .
. 74 法乗院 Hojo-In / 75 威徳寺 Itoku-Ji .
. 76 金剛院 Kongo-In / 77 仏乗院 Butsujo-In .
. 78 成就院 Joju-In / 79 専教院 Senkyo-In .
. 80 長延寺 Choen-Ji / 81 光蔵院 Kozo-In .
. 82 龍福院 Ryufuku-In / 83 蓮乗院 Renjo-In .
. 84 明王院 Myo-O-In / 85 観音寺 Kannon-Ji .
. 86 常泉院 Jozen-In / 87 護国寺 Gokoku-Ji .
. 88 文殊院（杉並区和泉4-18-17））Monju-In (Suginami, Izumi) . After the Meiji restoration, earthquakes and fires some temples were relocated outside of the central area, to make room for the modern city development. It is only important to start the Edo Gofunai pilgrimage at temple number 01 and end at temple number 88. 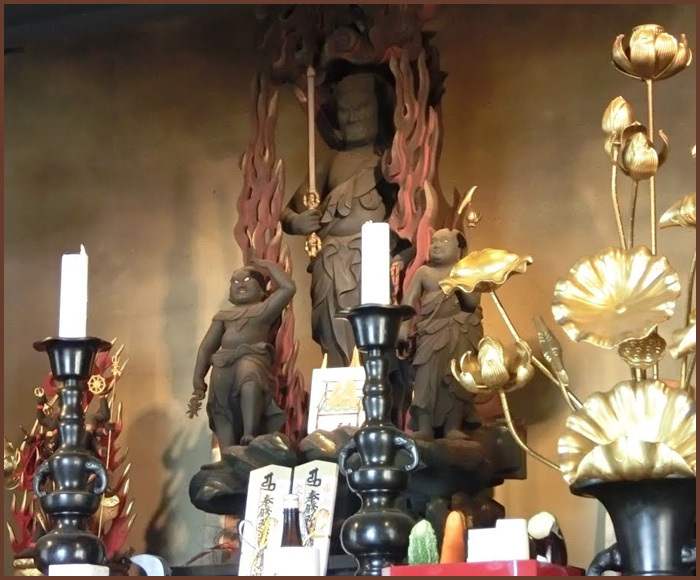 Its main statue is of Kukai Kobo Daishi, now placed in the hall Henjooden　遍照殿 Henjo-Den. Around 1600 the temple was located at 浅草日輪寺 Asakusa Nichirin-Ji as a place for the local Shingon priests to study. 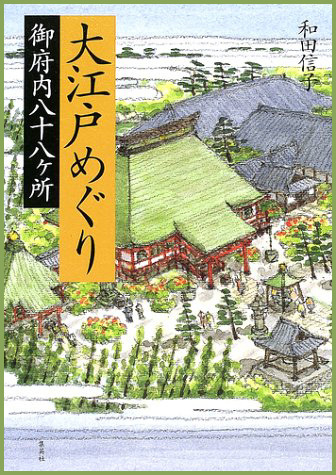 In 1655, it was relocated by the Bakufu government to Nihon Enoki 二本榎 in 芝 Shiba. In 1673, it was re-named 高野山江戸在番所高野寺 Koyasan Edo Zaibansho Koya-Ji, but lost in a fire in 1702. It was re-built in 1674 and now became the first temple of the official Bakufu Henro pilgrimage, Gofunai. In 1927, it got its present name, 高野山東京別院. The main hall was constructed in 1988.
. Ryoozenji 霊山寺 Ryozen-Ji - Shikoku Henro Nr. 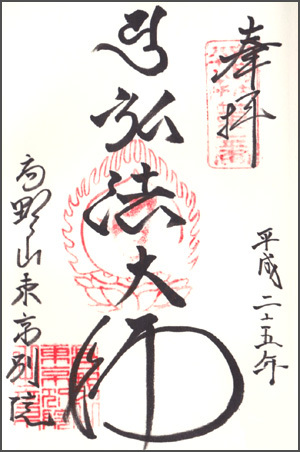 01 .
. 高輪銭洗不動 Takanawa Zeniarai Fudo. .
. Takanawa district 高輪, Takanawadai 高輪台 in Edo . Also known by the separate title Gofunai Biko. This work was organized to serve as reference for the 御府内風土記 Gofunai Fudoki to be compiled by the Tokugawa Shogunate, and was compiled in 2 parts consisting of a principal part and a sequel from 1826 to 1830. 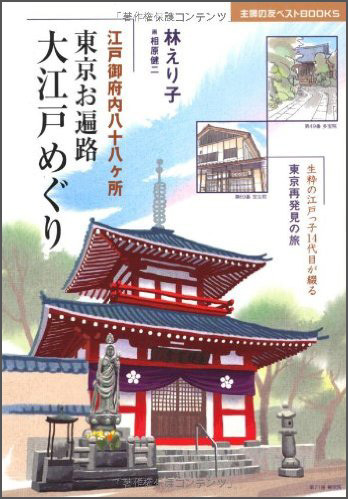 The 145 volumes of the main part contain articles on Edo Castle, streets, historic spots, etc.
. Welcome to Edo 江戸 ! - The Edopedia .
. Join the Gofunai Friends on Facebook ! .